What I Wore Sunday #whatiworesunday - ay jay kay squared.ay jay kay squared. 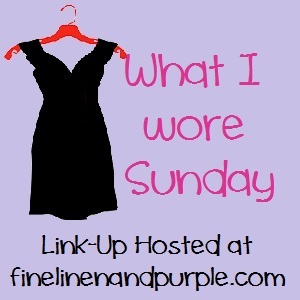 The purpose of the linkup is to share what you wore for Sunday church so we can all get some outfit ideas and just share in each others’ joy of attending church! 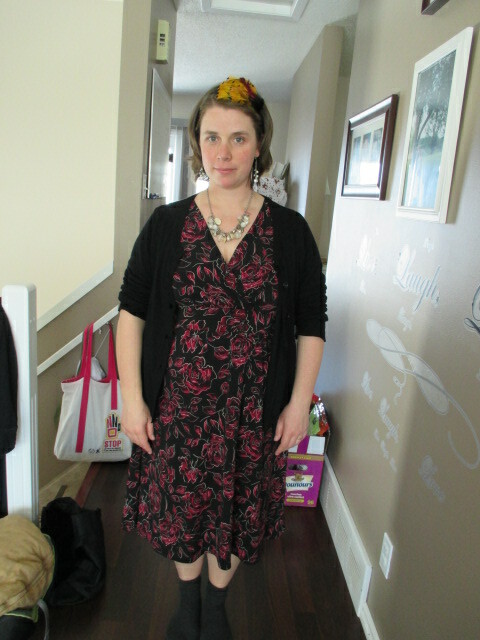 Hardly the most flattering picture, but today is not my day for pictures, it would seem. And in my defense, socks were not visible while I was wearing my boots. I had been hoping that it would be nice enough to forgo the socks and wear some cute shoes, but it was bloody cold outside and I nearly froze my fingers off scraping the windshield. Hand-me-down shirt and some black pants that were a birthday gift. Cassia didn’t get dressed up today; she stayed home with Andy, who is sick. I love Palm Sunday. Spencer’s been looking forward to Mass today because we’ve been reading him the story of when Jesus rode into Jerusalem on a donkey (colt). He was quite pleased to have a palm branch and proudly waved it around during the entrance into the church and hung out in the aisle while others were filing in, waving his branch around and making sure everyone saw him doing it. But he did get bored with the gospel reading. I don’t blame him. 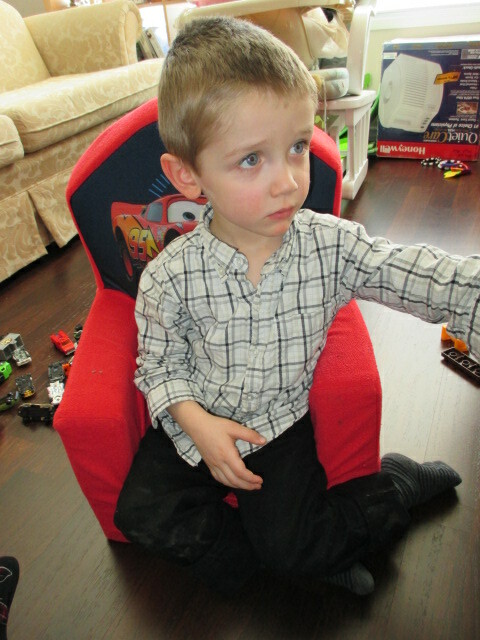 For a 3 year old, he did amazingly well. Overall in our prayer times (and outside of them too, come to think of it), he is surprisingly clever at remembering the things we talk about. Andy and I debated for a very short period how we should introduce the topic of Jesus dying and then rising. It didn’t last long though – we believe that the story speaks itself well and he has heard the biblical (not children’s) story of it. He has heard Jesus talking about going to Jerusalem to die (in the readings). He is curious about death – an innocent curiosity by one who has not felt the “sting” of death. I wonder how long that will last for. Hopefully quite awhile. Bishop Don celebrated the liturgy with us; I love his homilies. He referred to Palm Sunday as the liturgy that kind of takes him by the scruff of the neck and throws him into Holy Week, whether he wants to or is ready for it or not. It’s true – we hear the story of Jesus’ entry to Jerusalem through to his condemnation and his death on the cross. There’s no beating around the bush about it – we are here to celebrate for a reason and this week is a whole reminder of that reason. We’ll hear this reading again on Friday but with more finality. Oh, how I love the liturgies of Holy Week. Sombre, reflective, painful. But full of hope. Around the corner, there is a light shining. Only one more mile of this race left. Exhausted, we endure to experience that light, knowing it will not fail us. This entry was posted in Uncategorized and tagged holy week, Lent, sick, what I wore. Bookmark the permalink. I like your outfit, Jane, and the accessories. I’m impressed your son was familiar with the Gospel reading. My daughter is a little older I think (4 yr 2 mo.) and hasn’t a clue. We do read books about Jesus. I just broached the topic of Easter being about Jesus rising from the dead. Not sure what she made of it since her grasp on the concept of death is tenuous. Just socks??? It’s tights weather yet here and I pushed the line by wearing hose. You are BRAVE! Kinga: you’re right, of course, but I’m a sucker for dresses to church right now. And all my tights are dirty. Laura: we just decided to let it speak for itself; we didn’t specifically say, ‘hey, by the way, Jesus dies…’ it started around the time of the scrutinies – the story of Lazarus comes to mind. Also, I’ve been trying to read the daily gospel at breakfast time to everyone…I usually seem to scarf my meal and otherwise end up staring at the wall for awhile. There’s a lot more talk about his journey to Jerusalem to die in the daily readings.